Stories of family, faith, celebration, struggle and humor… #hogfan style. The “dream” for me, for my kids, for my husband and for our family. Back up to a time before all this crazy transitioning. I was reading the book, 100 Days to Brave by Annie Downs. I had started reading when I was feeling less than who I felt God had purposed me to be. I started it as a way to find my way back to what I knew myself to be, in God’s eyes. When the flurry of moving, transitioning from two households back to one household were taking place and everything seemed to be falling into place, I put the book to the side in late April. Fast forward to late July. I am about three weeks into my new position in Arkansas that I am over the moon about. I am living in a house I never dreamed I would live in. I have just traded the “soccer mom vehicle” for a sporty little car that makes me feel like I am in college again. I am celebrating 24 years of marriage to the best guy in the world. I should be on top of the world. But I am not. I am worried about my kids. We went from so many opportunities and experiences at their fingertips in Texas to a situation that I fret might limit them. I start to worry, try to control every connection, and orchestrate every move. I become the “helicopter mom” that engineers EVERYTHING. It is ugly. My kids in every public setting with others give me a wary look when I start “my thing.” I don’t like myself, they don’t say it, but they don’t like me either. I really didn’t even notice how bad I had become. I was operating from a place of fear not in a place of assurance and bravery that God has us all in the palm of his hand. We started school. August 13th, and like we always do we cheat and take our “Back toSchool” pictures the day before.I even went to the local college where EmBug is taking concurrent credit (college and high school credit at the same time) for a class and took a picture. So I can post on social media subtly “my kid is in college!” I think she met her limit (see the picture… if you know her that is “the look.”) I know, shameful! I did do something right in all this engineering of my kiddos future. We started praying every morning before they left for school. We did this the year before the family was living in two separate places. I honestly started it to, in my “wise” mind, to settle their nerves and subtly remind THEM, God is in control. I know, you can say it, what a hypocrite! I think those prayers, however, were slowly pulling at my own heart. So I picked up the book, “100 Days to Brave” again. The first night I started reading again, I posted on Instagram (See image). I was still in a state of worry, but the conviction to back off on my engineering was received and acknowledged. The next day after work when I was looking at the posts from friends, one of my dearest friends that walked me through the earliest parts of motherhood, replied to my post, “Oh KIWI, NOBODY loves your kids more than God does! Hard to remember, but keep trying! And… fear is imagining the future as if God is not in it.” If I didn’t know better I would have thought that God was speaking directly to me. Maybe he was, through my dear and wise friend. Tonight as I write this post, bearing a little bit of the reality, and knowing I have no idea what the future holds for my kids, I am at peace. That doesn’t mean I haven’t emailed a few teachers in haste since this revelation… I am a work in progress. 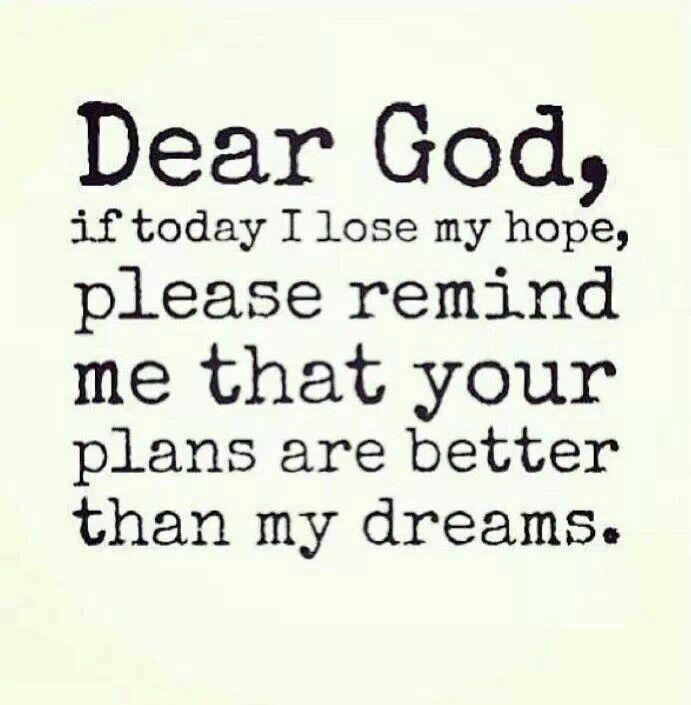 However, God’s plans are bigger than my dreams. Dreams for myself. Dreams for my kids. Dreams for my husband. Dreams for this family. Honestly, life is good. I am so grateful for life right now. Sitting on the back deck kicking back, drinking a beverage with my husband and listening to voices of my children as they chat back and forth about their day in the kitchen on the other side of the brick wall affixed to the deck. We are embracing our new life and, with God in control, it is beautiful. I have fallen into a Social Media trap. I post and brag about the perfection in my family’s life. I don’t share the ugly, the weaknesses, the shortcomings, the failures. It was ok for me to share the perfection. I was good with sharing, bragging, boasting of the things I had done, my husband had done or my children had done. But where was God in all this? Where was my reliance on my savior? Where was the being ok, if everything isn’t ok? Then it came, Memorial Day Weekend, the small domino of events chipping away at my resolve turned from a snowball of concern to the impending doom of an avalanche. My husband was pursued via litigation by a previous employer. For the next three weeks everyday was an unknown and my unease and fears grew. I hadn’t had the opportunity to reflect, reorganize, or refocus. Vacation was off the calendar, too. Then Friday, the final blow. His present employer stepped away. No income. So my pseudo-perfect world came crashing down. I found myself feeling vulnerable, afraid and questioning why. Why is God letting this happen? Then sweet friends have come to my side. Encouraging me in hugs, prayers and sending me words of encouragement and scripture. It is amazing. I feel “blessed” but in a humble and undeserving way. A way which I did not create or design. In the same way I was given Christ’s love, undeserved and without condition. Our little family has come together, and in true humor we are yelling “Plot Twist!” (see above meme) Having faith that God knows the plan. A plan not based on our actions but His character; we are confident we are loved and cared for by a God much greater than us. This morning I was reading His Word and trying to find peace in this season. My sister texted me the scripture below. It is the most comforting words I have received so far… and, of course, it is His word! As I go forward, I am not sure what the plan is. I will continue to post moments of things that my family have done that make my heart happy (plus I have grandparents to keep up to date on the latest about the kiddos). However, I am working on not making this about what I have done or deserve, but the true, transparent work God is doing in me and my family. I am working to be less perfect and more what is the real us. So just to let you know I am trying to #keepitreal and #keepitpositive, while giving the credit of all of this life I have to the one who provides… Abba, Father. I will praise Him in all things. I will praise Him… IN THIS STORM. We are about to hit a big milestone. Miss Embug is headed to Middle School. 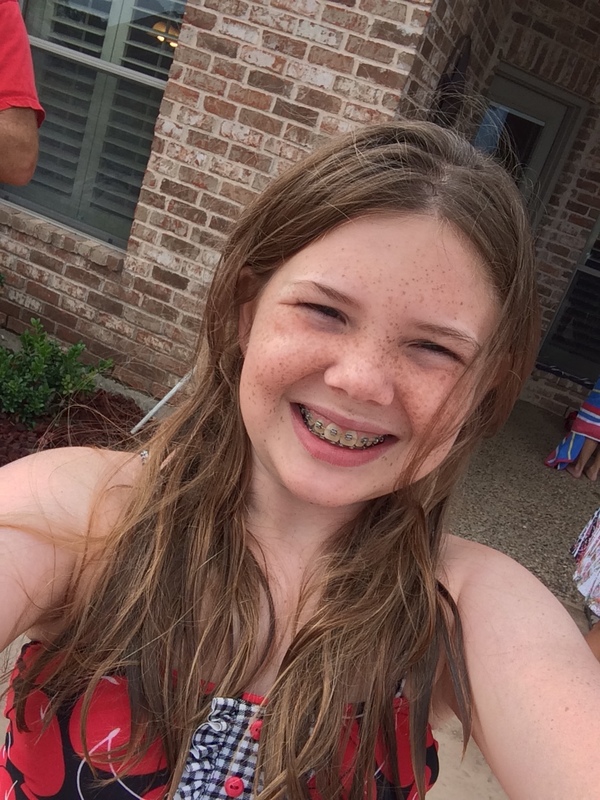 When the braces went on in late July, the reality of it all started to sink in… slowly. Their is a lot that I have struggled with as a parent lately. I am trying not to hold on too tightly. A difficult task for me in any situation due to my… um, “structured” approach to life (yes, ok, controlling!). What I have learned in a more direct way than ever, lately, is I have to let go, and let God. Funny thing is HE is affirming me and encouraging me all the way. I recently “re-started” a prayer book called “31 Days of Prayer” that was given to me 13 years ago. I started it then, but didn’t complete it. I found it when doing some closet cleaning and felt compelled by the Holy Spirit to start it again. I still am apprehensive about Miss EmBug going to middle school, but my fears have subsided. Since starting this book of prayer, I have seen God move in direct response to my prayer requests. I have seen miraculous healing, complicated situations become uncomplicated and progress occur where no hope of improvement seemed likely. Stories of family, faith, celebration, struggle and humor... #hogfan style.